During the upcoming, obligatory 72-hour refusal of Pasta and Pizza, the thoughts of Peter Sloterdijk on the connections between soccer, senses of belonging, nationality and participation might serve as a small element of reconciliation. Here comes an excerpt of the interview, the original German version can for instance be found here. The translation is courtesy of Peter Lauritzen (thanks!). Sloterdijk: â€œNational football teams have practically no real existence outside such a tournament. Within the tournament they function as â€˜Nation-simulatorsâ€™, which remind a population that they can identify with them, if they wish.ï¿½? Der Spiegel: â€œAnd this functions?ï¿½? 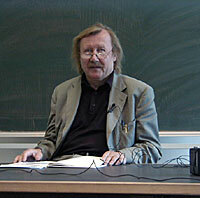 Sloterdijk: â€œVery well, because the desires of people to participate would be chronically underemployed otherwise. We do not live in a world which addresses needs to participate. On the contrary: one belongs all the time to oneself, or to oneâ€™s own future, in the best case. One has a few relations and on top of that one may be part of networks, as we say today. But people in networks are already in a postnational situation anyway. Generally, one does not want any more to be obsessed by a community. The drift of civilisation goes towards dissolutions of communities and this for a very good reason: because self-conscious individuals can no longer or only with difficulty bear to be bothered by â€˜groups of belongingâ€™. We do not want to be representatives of our own tribe and we do not want to represent our nation elsewhere. But then there are situations where one wants to identify with oneâ€™s nation for a few hours.ï¿½? Der Spiegel: â€œIf national identity comes through in the national team, would it not be logical then to write into the questionaires meant to legitimate immigration questions such as: Who has played for Germany in the final of 1974? As a kind of proof that somebody is really interested in the country?ï¿½? Sloterdijk: â€œWhy not? But then the possibility should exist to show by answering the opposite, that one belongs to this country. The bad Germans have been the good Germans so far â€” this should also be allowed to foreigners. Who intends to immigrate should have the freedom to say:â€™ I am a bad patriot, this is why this is the right country for me. This whole mischpoke of Beckenbauer and consorts can go to Coventry. I find sport idiotic and it would be best, if we loose. This is why I have a right to join this nation.â€™ ï¿½?